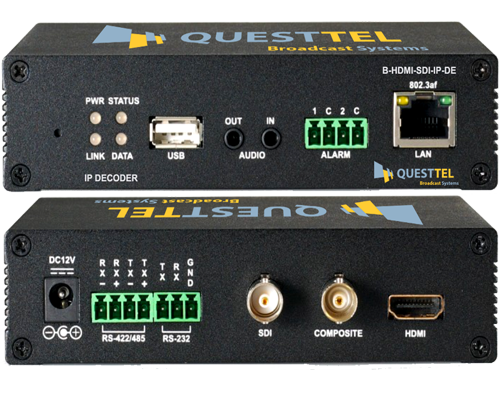 QuestTel's B-HDMI-SDI-IP-DE is a compact factor H.264 decoder specially designed for decoding real time internet streams to HDMI / SDI or Composite video interfaces, the unit supports both H.264 and MJPEG codecs. 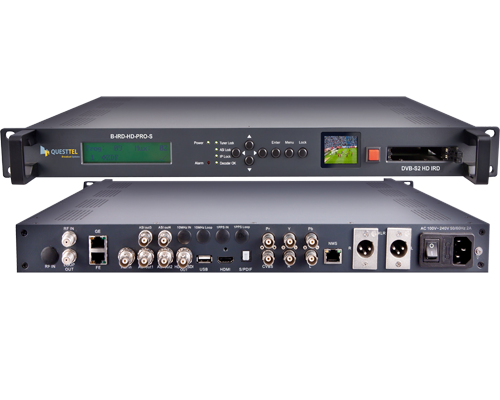 QuestTel's B-IRD-HD-PRO-S in an integrated receiver decoder with DVB-S2(DVB-S) tuner, the system is widely used by live broadcasters to receive broadcast RF signal and decode it for further distribution or conversion. 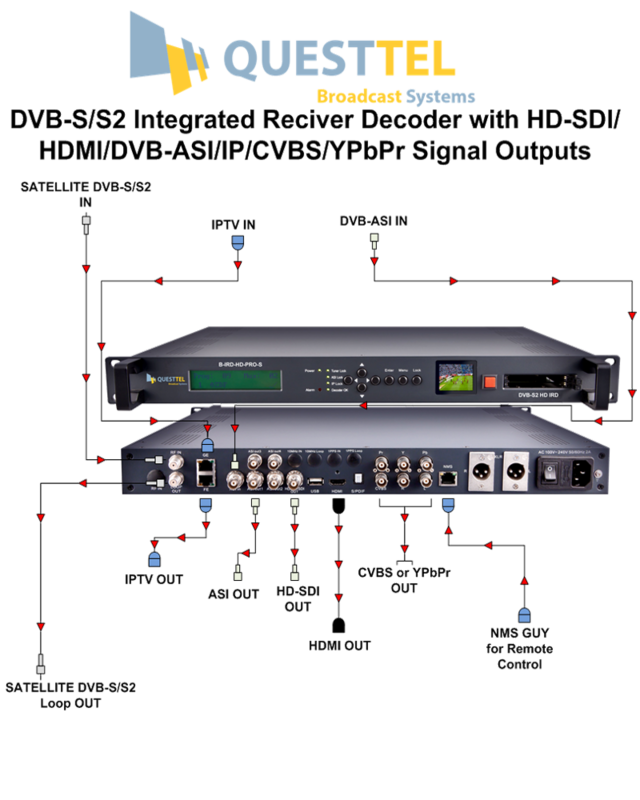 IRD is equipped with integrated CAM Module for signal de-encryption, it comes with vast variety of inputs and outputs: inputs are RF, IP and ASI, unit outputs IP, ASI and all professional video interfaces such as SDI, HDMI, CVBS, YPbPr, stereo balanced, stereo unbalanced and S/PDIF digital audio. B-IRD-HD-PRO-S provides great support for many broadcasting tools and features - unit comes with AC3 audio passthrough support and closed captioning for both 608 and 708. Modular architecture of the unit allows our engineers to integrate any digital tuner for RF signal receiving, following configurations are available - QAM, ATSC, DVB-T, DVB-C. Management access made easy with Web control panel for advanced settings and monitoring, unit is also equipped with LCD front panel for simple access to settings and video display to keep track of actual video output. B-IRD-HD-PRO-S is robust and powerful tool for any professional AV user for receiving and processing RF, ASI and IP signals.